Package Includes: 1 x 1200Mbps USB Wifi Adapter.1 x Mini CD driver.1 x User manual. Compatibility:Windows 2000/XP/Vista/7/8/8.1/10, Mac OS 10.4~10.11, Linux. 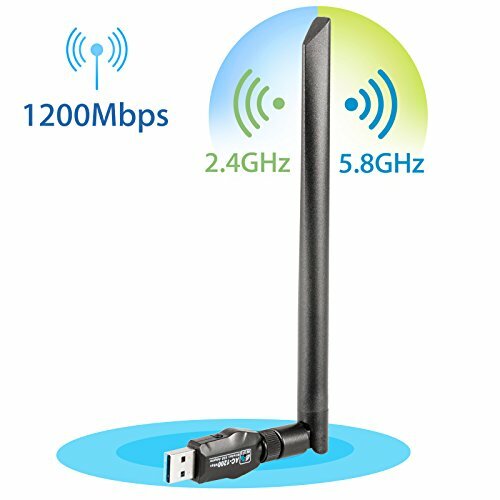 1200Mbps wifi adapter support dual band. Maximum speed up to 5.8GHz/802.11ac 867Mbps or 2.4GHz/802.11n 300Mbps. The 5dBi removable antenna provide strong penetrating ability and stability. It will stay good connection when signals are very weak. You can connect to Wi-Fi in your basement or bathroom even if your router is far away from your computer. This wifi adapter have WPS( Wi-Fi Protected Setup), one key encryption and protect your wireless network security. 1200Mbps Wi-Fi adapter support all WLAN routers: WPA/WPA2/WEP, it also support all brand wireless routers. Super Speed USB 3.0 transmission speed is 10 times faster than USB 2.0, uses more fluently and effectively. Easy Setup,Install the driver from the included CD. After the driver is installed, you can use the built-in wireless utility in your operating system to connect to a wireless network.